Macaws are one of the most familiar parrots. Even people who don't particularly know much about parrots will recognize these majestic birds. They have a very distinctive look--large beak, long tail, bare face patch--with a show-off personality that makes them popular in shows at zoos and theme parks. They're all over the place in advertising, especially if the ad has a tropical theme. One of the most recognized is probably the scarlet macaw. But macaws have far more to offer than just good looks and exotic flair. They're an intelligent pet that rewards the right type of owner with years of affectionate and fun-loving companionship, sometimes compared to dogs in terms of how well they respond to their people. No one should get a parrot without research and planning, and this is especially true for the larger species of macaws. Their caging needs alone make it out of the question for anyone with little space, and along with that big body comes a big attitude. Inexperienced parrot owners may not be prepared for a sassy, brassy macaw. And if you're looking for a parrot on the quiet side, forget it. Macaws' voices match their personalities: bold and almost always ready to go. There still may be some hope for you if you like what macaws have to offer but aren't able to accommodate such a large parrot. One of the smaller varieties might fit your lifestyle. You'd still need to know what you're getting into, though. Even the mini macaws require an owner that's dedicated and willing to establish rules and limits. A macaw of any size is not what I would consider a beginner's parrot. 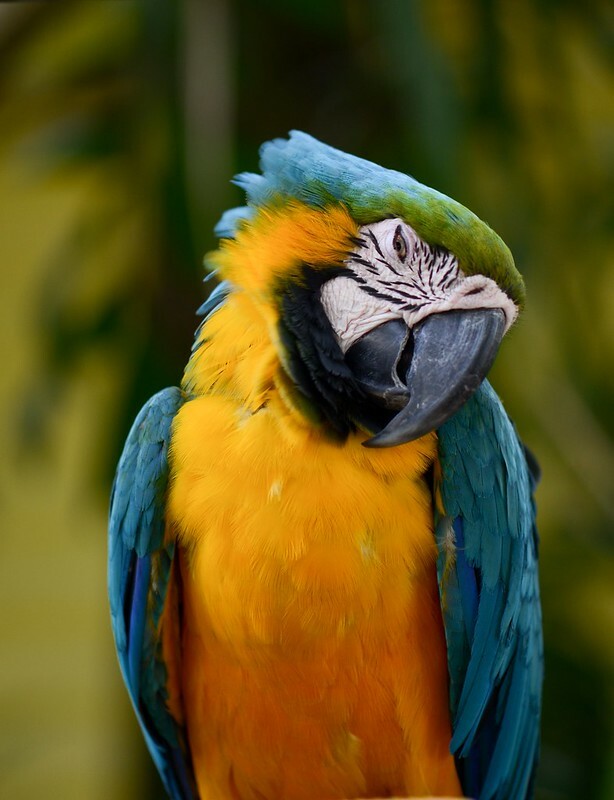 One challenge macaw owners can face is getting over any nervousness about those large beaks. Capable of snapping a broomstick, a macaw that means business isn't a bird you want to push around. They learn when they're young that hissing, lunging and brandishing that beak are effective ways to get what they want. But most macaws, as long as they've been treated kindly by people, are actually pretty gentle and easy going. They will rarely bite as hard as they're able. In the years that I've dealt with macaws of all ages and sizes, I've never received a serious bite, only some pinches that hurt at the time but didn't do any real harm. I've been screamed at loudly, though, which isn't pleasant and can be somewhat intimidating in its own way. If someone is working with a macaw and is overly hesitant, the bird is going to have that person's number right away. A calm, confident person tends to do much better with a macaw. They don't respond well to bullying, but they do need guidance and kind authority. Treated with respect and given the right environment, which includes plenty of out-of-the-cage exercises and mental stimulation, a macaw can be a joy. They like to be involved in whatever the family is doing and thrive when they can have the stage all to themselves. They're one of the major "hams" of the parrot world, so talking, singing and trick training are fine activities to do with a macaw. While some individuals don't mind just sitting around and may be able to spend a considerable amount of time on a play gym, a macaw will often want to investigate things, wandering around on the floor and climbing up onto anything he can get to. Supervision is important. They aren't the type of pet you'll want to let come and go at will from his cage. Doing so can lead to behavior problems, such as the bird becoming overly pushy and willful, but it's also likely to result in lots of chewed-up items around the house. Remember, think "guidance" and "limits". Give them more chances to be good than to misbehave. Behavior problems in macaws can range from minor, hormonal moodiness to all-out mayhem with biting and excessive screaming. Rescued macaws that were mistreated, ignored, or just not well-trained seem to have the most issues, but even these guys can come around in time. Macaws are very social and will usually want to have a relationship with the people around them. They've got big hearts to go along with their big beaks. This article was co-authored by Chet Womach and Kim Bear. Kim is a parrot behavioral specialist who has helped people with their macaw parrot all over the world. When selecting what type of new pet bird would best suit your circumstances and desire there are a few things you must consider before making that all-important purchase. During my 10 years experience, I have only dealt with small pet birds so unfortunately for some my knowledge is restricted to these only. Firstly you must decide what type of bird you would like and if it would be suitable to your circumstances, then you need to be sure you have a home set up for your new feathered friend before you bring it home. From the parrot family and originally from Australia the budgie is often called 'parakeet' or 'long-tailed parakeet', the budgerigar is without a doubt the most popular pet bird in the Western world and with good reason; small enough to handle, easy to tame, inexpensive, a startling array of different colours, can be kept on its own, very friendly (if tame), a chatterer, minimum requirement to keep in good health, easy to breed (if you want to), usually mixes well with other small birds (budgies and other species). Ideal in a cage or aviary. 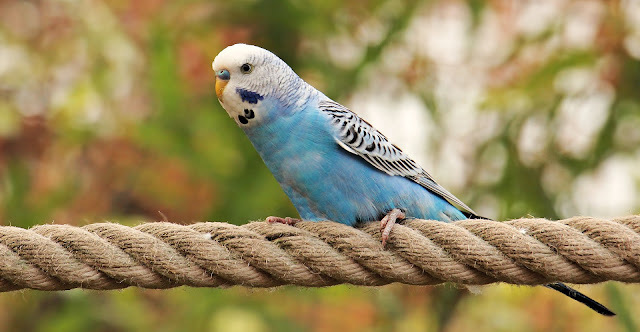 However budgies can inflict a nasty wound if they bite you whilst handling (rarely a problem if they're tame, but they can draw blood if they sink their beak in), they can also be rather destructive (they love to chew), and budgerigars can be very territorial during breeding (especially if kept with other birds). In the wild budgies live in large flocks and so need plenty of interaction to save them from becoming bored. They, therefore, need to be kept busy with lots of toys and your attention, or alternatively kept with another of their kind, so as they can interact with each other. Another Australian bird often called 'tiel' for short, these small parrots are also very popular as pets, due to their calm nature and unique character. A little bigger than the budgie so more space is required (a bigger cage for example), the cockatiel also lives in large flocks in the wild so again interaction and toys are a must. They can be kept their own or in pairs or small groups, and easy to keep. Ideal as a cage or aviary bird, and because of their calm nature the cockatiel will normally mix well with other small birds of a different species (cockatiels are often kept in the same aviary as budgerigars and finches with rarely any problems). They can learn to mimic other sounds with patience and determination and are easy to tame. However they can also inflict a rather nasty wound if they choose to bite (probably a worse injury than the budgie due to their larger beaks, but again not usually a problem when tame). Ideally, if you want to breed your cockatiels they need to be on their own as a breeding pair with no other birds. These birds can also be very destructive due to their desire to have a chew at almost anything, but they are easily startled (so no sudden loud noises or sudden bright lights please!). Somewhat smaller than budgerigars and cockatiels, and not part of the parrot family, the most popular types of finch are again very popular for good reason: very easy to keep, good-natured, small and compact, extremely active, cute, prolific breeders, usually low priced, little space required for good upkeep (the perfect pet bird for apartments, flats and small living areas). There are many types of finch available on the pet bird market but the most popular are: zebra finch, society finch (Bengalese finch), Gouldian finch, java finch (java sparrow), the java being the largest of the four just mentioned (slightly smaller than the budgie). All of these can be accommodated in a cage or aviary and also usually mix well with other species (I keep budgerigars, cockatiels, zebra finches, Bengalese finches, and javas together in a large outdoor aviary and very rarely have any problems). As for the initial cost of these little characters the zebra finches usually come out the least expensive (from 3 to 8 each, often with a good deal for a pair), next would be the society finches (from 5 to 10 each, again with a better deal for a pair), then the javas (8 to 15 each, buy two for a better price), and the Gouldian finches coming out on top (the cheapest I've seen there is about 20 each right up to 60 - sometimes more - but a deal on more than one can usually be arranged). The reason for the bigger price for the Gouldians is because of their great colouring and rarity, a desirable bird that people will often pay handsomely for. However, finches do not always take readily to handling and must be kept in groups of 2 or more. At least due to their small size, a bite is not likely to bother you a great deal. There are many other types of birds available but the price is usually higher as they are not as common. 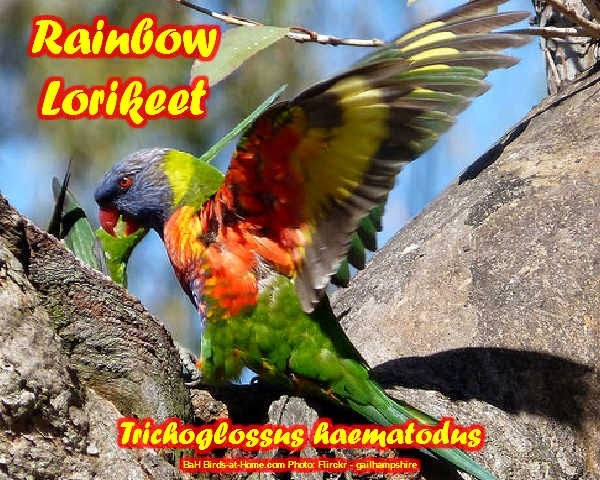 Many other types of parakeets, however, are still rather popular - ringneck parakeet, grass parakeet (Bourke, turquoise, elegant, alexandrine), kakariki (New-Zealand parakeet), rosella, lovebird to name but a few. The upkeep however for all small pet birds is basically the same. Always remember to shop around for the best deal and if possible buy your new bird or birds from a breeder or hobbyist rather than a pet shop. A note on accommodation for your new pet bird. Most small pet birds will live happily in an aviary, and this is the nearest they are likely to get to their natural environment, but in an aviary, your birds will become semi-wild and may not take very well to handling or one on one interaction. Caged birds, however, are a different matter, and can often be tame and friendly towards us humans. Make sure that if you plan to keep your bird or birds in a cage then go for the biggest you can afford (within reason, of course, no good putting zebra finches in a large wide barred parrot cage); your bird needs to be able to stretch its wings to their fullest extent and still have some room left. Even in an aviary parrot type species will spend more time climbing than flying, whereas finches would rather fly than climb. Lovebird's care isn't a simple achievement. You must keep in mind the things they require, to keep them healthy and in good condition. They deserve to be supplied with correct nourishment, with the most healthy foods, cages, toys, and allocated special time to bond with their owner. They adore interaction for their socially active creatures. 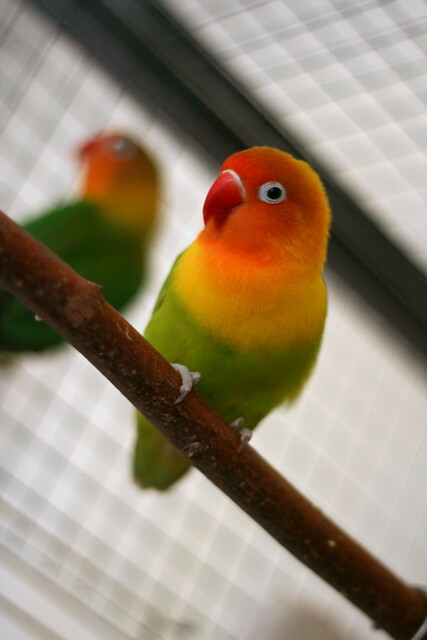 Without social interaction either with a human or another Lovebird or not having diversions, Lovebirds can be bored and stressed that might result in a behavior problem. Certainly, you as a Lovebird owner do not want that. This makes an important addition to your Lovebirds care list. Do not get inexpensive feed for your Lovebirds. This may be listed in your Lovebirds care list, inexpensive, cheap seed mix or pellets regularly do not have enough nutrients your Lovebirds need to keep them healthy, but they can also be used, if and only if you provide fresh foods for your Lovebirds. Try and give them fresh foods at least 3 to 4 times per week. Lovebirds love fruits except for avocados, don't give them those for they're deadly - add this to your Lovebird's care list. Just ensure you have washed it from the insecticides and pesticides utilized by plant growers. Another addition in your Lovebirds care list - remove all uneaten fresh foods from your Lovebirds cage before they're ruined. Another addition to your Lovebird's care list is that you want to supply a dish of water for your Lovebirds, they're dependent on water, and they adore to wash. This also helps keep their feathers in good shape. You must also take into account, the weather, Lovebirds shouldn't be exposed to freezing conditions (add to your Lovebird's care list). There are lots of perils coaxing around the corner you may not know. A number of them that you may want to put in your Lovebird's care list are blue-green algae, chocolate, dog and cat spit, household cleaners and detergents and Teflon. When Teflon is heated and gets too hot it gives off smoke that is deadly to your Lovebirds. It's also best to get a good vet before any bad conditions arise. You can try for suggestions, because there are vets who see few cases of bird health issues, and don't have much experience in diagnosing and treating them. One thing more you need to put on the list for your Lovebird care is the cage. Plenty of things can become a difficulty if you do not have the right cage for your Lovebirds and the right place to put it. You must ensure the cage is of suitable size. Lovebirds like to fly around, so you should confirm it is sufficiently big enough for them to be in a position to enjoy flying. Also, you need to place your Lovebirds cage in a spot where there's good daylight. Lovebirds like to get warm under the sun after showering. Having this information about Lovebird care , you know how the how's and why's of keeping a Lovebird. Good luck. A finch makes an ideal pet for every bird enthusiast because of their vibrant colors and beautiful singing voice. But one must also know several concerns in having finches for a pet. Zebra and society finch are among the popular finches. They have bright beautiful colors and some even sing beautifully. The Lady Gouldian, on the other hand, is best to have if they are on their full-color as they are hardier while youngsters are delicate and cannot acclimatize easily to changes. Some variety of finches that are best for a more experienced bird enthusiasts are the cordons, gold-breasted, strawberry, fire, orange cheek, star, tricolor nuns, read ear, cutthroat, parson's, shaft-tail, spice, lavender, owl, silverbill, bronze wing, cherry headed, European goldfinch, weavers, blue-headed parrot finch, and red-headed parrot finch where most of these species need more than a commercial seed in their diet. The sweet sound that a finch makes can be attributed to the male finches. The song that the male finch makes is actually a sound to attract females during the mating season. The European gold, green singer and grey singer finches are the best singing finches. Finches do not need much attention that makes them a perfect pet for people with limited space and time. Finches are social but only to birds and not to humans that they must be bought in pairs. Keeping several varieties of finches in one cage could make them squabble especially during mating season. You must also take into consideration the size of the finches you are going to put in one cage. It is better to have a pair of finches of the same size so that one would not get intimated if the other finch is larger. It is important for the finch to have a flying space inside their cage as flying is the form of exercise, that will keep them healthy and active. 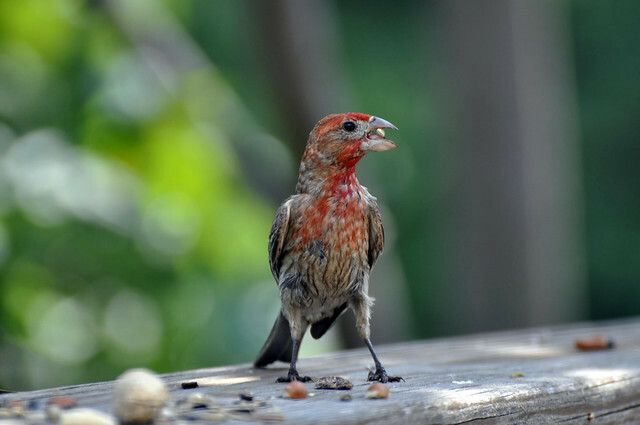 Livefood like mealworms and some leafy greens must be added to the diet of finches aside from their regular seeds. You can also put cuttlebone or calcium block inside their cage to ensure that they are getting enough calcium. The article is directed specifically to pet bird owners and is intended for their use as a basic how-to guide on caring properly for a sick or injured bird. Please always follow the advice of your veterinarian & do not use this article as a means of avoiding a hands-on veterinary examination. The key idea of this article is to reduce any and all stress to your recovering bird. Ill birds will sit with their feathers fluffed in an attempt to conserve heat. The effort to conserve heat places an additional burden on the already debilitated bird. Your veterinarian will determine if your bird requires hospitalization, but if home care is acceptable, I recommend creating a tent to keep your bird warm. A bird's natural temperature is much higher than ours at anywhere from 103F-106F. Therefore, what often feels warm to us can be chilly to them and this is particularly true in sick birds. A simple way of providing heat is to cover 1/2 of the cage with a blanket and place a heat lamp on the other side as a heat source. Generally speaking, we keep our sick birds at environmental temperatures ranging from 85-95F. This will vary greatly with the individual bird so it is important to monitor your pet to ensure that you are providing the correct temperature and of course seek your veterinarian's advice. A bird that is too hot will have very sleek feathers held tightly to the body, will hold its wings (shoulders) slightly away from its body and may pant. If you see any of these signs your bird is much too warm and the environmental temperature should be reduced accordingly. For night warmth I recommend using a red light. Ill birds, just like ill people, require rest and if kept under bright lights all night they will become sleep deprived. Also, during the day it is important to provide light so that they may be encouraged to eat and can be monitored. Therefore, the entire cage should never be covered during the day. I don't recommend heating pads because it is very difficult to regulate the temperature. If a bird is not perching and sitting directly on the pad they can easily become overheated or burned. And in my experience baby birds that are raised on heating pad quickly become dehydrated and again are subject to burns. Debilitated birds must be kept in a stress-free situation. Often what appears normal to us can cause stress in our feathered friends. I suggest taking a close look at your bird's environment with a critical eye to determine what may be stress factors. Some common ones include, the bird in the center of house traffic with no chance to rest, cigarette smoke or aerosols in the birds environment, lack of darkness/sleep time at night, other pets, small children, too much visual stimuli (cage directly in front of a window), competition from cage mates, too much handling, poor nutrition and temperature extremes (such as birds kept in kitchens). I recommend that sick birds be left in their cage and allowed to calmly recuperate. Think of this as bed rest for your pet! Too much handling can stress the bird and will require the bird to use additional calories. If the bird is housed with other birds, it is usually best to remove the bird to a single cage. Some birds can become too stressed when separated from the colony so you should seek your veterinarian's advice on how to cage your sick pet. However, generally removing the bird from the group will reduce the stress of competition for nutrition and allow for medicating easily and better monitoring. Of course, if an infectious disease is suspected, then the pet must be moved into an isolation cage and at least a separate room - preferably a separate house with no other birds. If your doctor made dietary recommendations, now is not the time to implement change. Changes in the type of diet will cause enormous stress to your bird and should be started when the bird has recovered. Always discuss how and when to made dietary changes with your pet's doctor. Generally, I recommend offering all the bird's favorite foods during illness because many ill birds become anorexic and can be lost due to starvation. If your bird is normally a seedeater but not currently eating, try placing millets sprays in the cage which most birds enjoy. The important thing to remember is that it has taken months to years for the bird to become malnourished and this cannot be corrected in a day or a week. Slow changes are essential for the ill bird. If you are unable to get your pet to eat he/she should be hospitalized for gavage feeding and further care. Birds have a high metabolic rate and can quickly starve. Thus, a pet bird that stops eating should always be assumed to be critically ill, certainly, the potential for fatality is present. Lastly, if your bird is a hand reared baby and is not eating due to illness, you can often revert them back to hand feeding (syringe feeding) during the convalescent period. A good hand rearing formula should be used. The formula should be mixed with hot water as directed on the bag and offered to the bird. Do not force the bird to eat. Pet owners should never force feed their birds. A bird can easily aspirate (inhale food) and develop pneumonia and force-feeding causes enormous stress to your bird. Reverting to hand feeding is only of use for those birds that willingly accept feeding on the syringe. Also, if hand feeding, the formula must be warmed correctly (follow the advice on the formula bag and that of your veterinarian) to avoid food burns from too hot formula and crop stasis from formula fed at too cool a temperature. I prefer not to medicate in the pet's water or the food. Medication is given in this way often causes a change in the taste and can potentially cause the bird to reduce their food and water intake. Also, when medication is placed in the food or water it is very difficult to determine how much of the medication the pet has actually ingested. Thus, in my opinion, the best routes are injectable and oral. Topical medication often is not of use to the pet and will cause oily feathers. Prior to taking your bird home, you should be shown how to appropriately medicate your bird by the doctor or technician. Briefly, the patient should be held in an upright position and the syringe containing the medication should be gently introduced from the left side of the mouth and angled to the right side. Most birds will attempt to bite the syringe allowing it to be easily introduced into the oral cavity. Slowly depress the plunger on the syringe to dispense the medication into the lower portion of the beak. If the pet struggles while medicating, stop for a few moments and then try again. You should advise your veterinarian if you are unable to medicate your pet. Medication can be mixed with a flavoring agent (FlavorX), which will help to reduce some resistance. Occasionally, depending on the reason for treatment, your doctor may be able to give a long-acting injection in place of oral medication but this has limited uses and thus is not available for every pet. As soon as the illness was detected in your pet he/she was taken to the veterinarian for a thorough physical examination and diagnostic workup including laboratory testing. Unfortunately, many people will see that their pet is improving and don't realize that a follow-up exam is necessary. I always suggest rechecking the patient at variable intervals depending on the state of debilitation. The recheck exam allows your doctor to assess the patient's response to treatment and the owner's compliance with instructions. Many times in the course of treating an exotic pet the treatment must be altered somewhat to ensure the best response. These rechecks are also used as a way of reinforcing the changes needed for the bird to remain healthy. Additionally, lab values can be rechecked to ensure that the patient is truly recovering and not just feeling well enough again to resume hiding any weakness. I can't stress the importance of this follow up enough, it is extremely important to the health of your bird. Most importantly, follow the advice of your veterinarian and ask questions to ensure that you completely understand what is needed of you to get your pet back to health. Visit littlecrittersvet for extensive information on small & exotic pet care with > 1000 photos of animals from informative to just darn cute. Just like people, birds get hot and thirsty. Especially during the blistering summer months, your favorite flying friends may be roasting in their feathers. Help out your local birds and provide them with a shady spot to splash, play, bathe, and drink—a bird bath! Especially in areas that lack natural sources of water, such as springs, ponds, lakes, or streams, bird baths are essential for the health and happiness of birds in your area. In addition to helping out your fine feathered friends, a birdbath will attract all sorts of birds to your yard and allow you and your family to enjoy their company. Think of it: if you were a bird, where would you want to splash about? Would you choose a muddy, stinky puddle or a clean, fresh bird bath? The choice is not just obvious to humans, but birds have a distinct preference. Once you have decided to lend a helping hand to your local birds, make the trek to find a bath that fits into your style and design of your yard. There are tons of options, from baths that borrow style from the white marble columns of ancient Greece to fantastically modern creations that could double for an avant-garde statue. After you have brought your birdbath home, find a place to set up the bath well within sight of your outdoor and indoor spaces. Consider installing a birdbath near your porch, patio, deck, or house’s windows so that you can enjoy the birds from anywhere in your home. Fill the birdbath with cool, clean water and watch the birds flock around your bath. In order to draw more birds, consider using a fountain birdbath instead of a traditional birdbath that holds still water. Birds love the sound of running water and prefer fountain bird baths dramatically over still bird baths. If a fountain bird bath is out of your budget, consider creating your own fountain. Something as simple as a bucket with a hole drilled in the bottom positioned over the top of your existing birdbath works just as great as expensive fountain bird bath, although it may not be quite as aesthetically pleasing. Keep in mind that birds need bird baths year round, especially in some parts of the country that seem to be out of the grip of Jack Frost. Instead of putting your birdbath inside during the winter, purchase a model that can remain outdoors for the entire year. Heated bird baths work to ensure that ice does not form in the bath, but does not produce a birdie hot tub, so birds will keep coming to your yard regardless of the weather. This is a photograph of three chicks hatching in an incubator. There are two types of chicks to raise: the ones you practically took care of from the moment they were hatched and the ones that you bought from hatcheries which are already taken care of and just needs further nourishing. Basing from the two choices, there are also two ways of properly raising the chicks before becoming the perfect chickens. Chicks hatched from your own poultry’s eggs basically need 4 things: comfort, warmth, food and water. Comfort can be based on your own personal touch and how you hold the chicks. Warmth is taken from the mother or if you plan to separate the chicks on an early stage, an incubator or what others call as a heat lamp is essential. Usually, the incubator is composed of two or three light bulbs depending on the number of chicks that have hatched. The very first thing to do is fix the place where you will put your hatchlings – the brooder. It must have a temperature that is neither too cold nor too hot. Either of the two extremes will contribute severe negative conditions to the chicks. Your incubator must have a temperature that’s 90-95 degrees. If you have settled with the 95-degree heat, maintain it until the end of the first week. Your temperature must decrease every week by 5 degrees until you reach the 6th week. The floor of your chick’s pad must be made of cardboard or piles of old newspapers. This can be used as an insulator for keeping the temperature in the room in proper condition. Have the drinking station of your chicks always cleaned? Aside from that, the proper way of refreshing your chicks is to give them boiled water. Something as little as these creatures are too vulnerable to germs. Their baby immune systems aren’t that mature to fight away bacteria and harmful microorganisms that may invade their body. Better safe than sorry. Grain coffee is also an alternative but will cost you. You have to make sure that what you give them is not that hot to handle. To serve their drink, pour the contents in a jug, turn it upside down standing on a dish. The leak coming from the inverted jug is sufficient enough to accommodate their need for nourishment. Chicks are a little particular with their food. They don’t eat anything “old”. They want their food dripping with freshness. Initially, you could give them milled oats. You could include bits of boiled eggs into the milled oats. If you think to give them that is a bit too mushy, you are welcome to go to feed stores for poultry raising. Some who are fond of feeding anything to their chicks have this intuition to feed them bread. Which is totally wrong. Because feeding them bread is a sin. This can kill them. You could also include lettuce cuts into the diet. Squeamish or not, you have to provide their favorite menu – bugs and grubs. They eat these little wiggly things and gobble them up so fast. Just don’t make any mistake of giving these to newly hatched chicks. You have to be very particular of the space that you have provided for the young ones. Cramping must be avoided. This might result in trampling and worse, cannibalism. Chicks grow quickly. That’s why you have to ensure that their room is big enough for their proper accommodation. Do replace the cardboard or the newspaper placed under their pad every time you notice it’s soiled. Even you wouldn’t like the idea of sleeping in your own feces. Pigeon racing is a sport of releasing pigeons that are specially bred, trained and conditioned for the races that generally vary from 100-1000 km. The winner is the bird that travels with the highest velocity. Where to find racing pigeons? Complete sell out: In the type of pigeon auction, the loft sells all the birds, clocks and pigeon supplies. Loft reduction auction: this involves reduction of the number of birds in a loft. However, it will still take part in pigeons racing. Special auction: special birds are put to sale in this type of pigeon auction. Donation Auction: the special pigeon is donated to a charity or fund-raiser. participating in any of the above pigeon auction ones should do his homework well. If you cannot afford to buy a trained racing pigeon, you can purchase the pigeons you love and train them. Before participating in online pigeon auctions make sure that the auction company has a good reputation regarding the quality of pigeon supplies, qualities of pigeon racing lofts and the type of conditions and race courses the seller fly. If you are attending the racing pigeon auction in person, then make sure to arrive at the place well before the auction time. This will give time to look over the birds and their pedigrees. As a result, you will be able to make a right decision at the time pigeon auction on which bird to buy. If you do not have enough expertise in studying the racing pigeon loft take the help of experienced pigeon breeders. Assess the pigeons on the basis of the performance but not the appearance of wings, throat, back and muscles. Sometimes it may not be possible for the fancier to attend the auction. In such cases, certain actions allow placing proxy bids or mail in bids well in advance. They even allow the fancier to place the maximum bid on a bird. Regardless if you decide to find pigeons at auctions or you choose to breed your own birds, the sport of pigeon racing is one of the most enjoyable activities one could experience! Most fanciers have been breeding and raising birds their whole life and really just enjoy the process of raising and training their birds. I have been making a full-time income reviewing products online. I take great pride in educating my readers with accurate information while also providing honest unbiased reviews. I hope I provided you with top-notch information that you can share with other people who share our same interests! Pigeon racing has been an interest of mine for several years. I find the process fascinating from breeding to training to racing pigeons. Budgerigar, Melopsittacus undulatus fighting on a perch. As the weather cools down, it's important to remember that birds need additional care in winter. Many of our exotic and pet bird breeds are originally from warm, tropical climates and cold temperatures can be a health challenge. Here are a few guidelines for pet bird owners to keep in mind during cooler temperatures that will help them keep their pet birds healthy and happy. Bird owners should move the cage to a draft-free location, away from windows and doors. Moving your bird's cage to a central location in the home can make a big difference in keeping deadly drafts and cold air away from sensitive birds. Shrink-wrap insulation kits can be used on windows and unused doorways in winter to keep cold air out and warm air in. Increasing the humidity indoors in winter is also good for birds, eliminating dryness and excess dander. Remember that birds are sensitive to smoke and fumes that can come from wood, gas or kerosene heaters. Some electric heaters are treated with a non-stick coating, which can create fumes that are deadly to birds. Some radiator-style electric heaters can be effective, but be sure to check on possibly harmful coatings. Bird owners should definitely have a cage cover on hand. Covering the cage at night will help keep birds cosy. Some birds enjoy snuggles and snoozes to help keep them warm at night. Heat lamps can be used, and infrared bulbs will create a glow that does not interfere with the bird's sleep cycle. It's important to choose only a bird-safe heat lamp recommended for avian use. Pay attention to the bulbs used in the heat lamp - any bulbs coated with polytetrafluoroethylene can emit toxic fumes when overheated. There are also ceramic heating elements that can be used for birds - from those that clamp onto the cage to heat panels that are placed around the cage. These are specifically designed for animal and avian use. Infrared heat panels that attach to the cage are also an energy-efficient way to keep your bird cosy this winter. In addition to keeping your bird warm, you'll want to ensure that heating your home doesn't result in a lack of humidity. If so, there are a few simple things you can do to provide the proper conditions for your bird. Regular baths, showers or light misting should be continued throughout the winter months. You can also increase humidity in the home by using a vaporizer or humidifier designed for birds. Other options include placing shallow pans of water on radiators or in the oven when you're pre-heating it, or simply leaving the bathroom door open when you shower to allow the steam into the house. Feeding your bird a healthy, vitamin-rich diet throughout the year will help boost its immune system and stay healthier despite changes in temperature. Bird owners should make sure the winter diet includes plenty of fruits and vegetables to maintain optimal health. Of course, keeping a watchful eye on pet birds throughout the winter is important. As you make changes to your bird's environment, be on the lookout for signs of overheating, such as panting, extended neck or holding the wings away from the body. Also, keep an eye out for signs of any health problems - exposure to cold temperatures can lower the bird's immunity and result in illness. At any time of year, simple bird care and monitoring will ensure that pet birds stay healthy and happy. Wyld's Wingdom, established in 1986, is the premier wholesale pet supply distributor for exotic and pet bird products including toys, food, cages, and supplies. We carry an enormous array of avian products at great values that customers can pass along to their retail setting. With its extensive expertise partnered with a tremendous selection of products, Wyld's Wingdom will provide the best information and advice to its customers on the latest bird care, safety, and wellness information. Visit our website at http://www.wingdom.com.